Tomorrow Stefano and I are going to Milan mainly to see Leonardo Da Vinci’s “Last Supper” (L’Ultima Cena). Stefano made reservations months ago…I mean, you can’t simply show up at the convent of Santa Maria delle Grazie in Milan and buy a ticket. You won’t get in. You have to go online (or call), see which dates are available and book. We booked in June. Stefano has never been to Milan, and I’ve been there only a couple of times…All I remember about the city is that the Duomo (i.e. the cathedral) is quite spectacular…and the Navigli area is interesting…oh, and the Castello Sforzesco is nice. That’s about it. I mean, even the biggest Milan fanatic in the world wouldn’t be able to declare that Milan is more beautiful or interesting than, say, Florence (that was totally a random pick, eh! 😉 )…But it should be fun. Stefano and I are going to stay overnight in a FOUR-star hotel (!). No kidding. Four stars. You see, I found a great rate (online), and then, just to make sure everything was okay, I called the hotel and chatted with the manager. Within minutes, he had upgraded our room to a superior one for the same price. 🙂 That happens to me quite frequently. I guess I have the magic touch (or some such thing)….whatever. In case you’re worried about the cats: we’re leaving them in very good hands. Their favorite person in the world (besides me, Stefano and my parents) is moving in with them for two days. They’ll be thrilled! A guy is driving around the back woods of Montana when he sees a sign in front of a broken down shanty-style house: ‘Talking Dog For Sale.’ He rings the bell. The owner appears and tells him the dog is in the backyard. The guy goes into the backyard and sees a nice-looking Labrador Retriever sitting there. ‘Ten dollars,’ the owner replies. …and you only had a few seconds or, let’s say, a few minutes to rush to safety, what would you take with you? That’s a food-for-thought question I read in an Italian newspaper article this morning. Hmmm, yes, what would I save? Obviously, I’d first make sure that Stefano was safe. And then I’d get the cats outside. But if I had a little more time, what else would I grab? That’s a toughie. So, what would YOU save? I was visiting my son and daughter-in-law last night when I asked if I could borrow a newspaper. 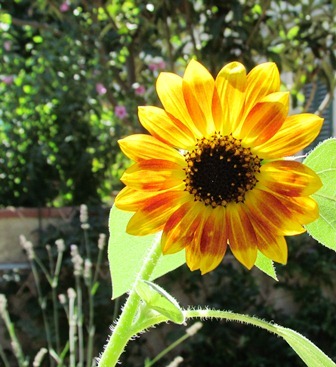 In spite of the prolonged drought and this tremendous heat, my sunflower in the back yard keeps on blooming. It’s huge. I really should give it a nickname, something like “Mightybig.” I mean, it’s now taller than I am…taller than Stefano, in fact. I thought “Caligula,” the beastly hot anticyclone hovering over Italy right now, was bad enough…but in a couple of days Italy (and part of Europe) is going to be hit by “Lucifer,” the biggest (3 million kilometers wide!!!) and baddest anticyclone of the summer…Yikes! “Curcumin, found in turmeric, stopped the potentially deadly Rift Valley Fever virus from multiplying in infected cells“: http://goo.gl/4WLnZ Incredible, huh? And then there’s this…also very discouraging: http://goo.gl/YGts0 In a nutshell, 85 percent of researchers involved in promoting off-label drug use do not adequately disclose financial conflicts of interest in published articles. 85 PERCENT!!!!! Mainly for reasons of space, I decided to post only one of TAB’s graphs. I chose this particular one because it shows his data in reference to the International Staging System, or ISS (see http://goo.gl/ycu7K for more info on this myeloma staging system, courtesy of the IMF). As you can see, TAB’s ISS trend is a downward one, which is excellent, of course! And now let’s finally have a quick look at what I’ve been calling Plan B. In a nutshell, back when I was having all that technical trouble (all resolved now, btw…in fact, I have just been awarded the coveted title of “Summer 2012 Fastest Converter Wizardess” 😉 ), TAB informed me that he set up a public e-mail address that you can use to get in touch with him directly. Purrrrrfect. So, if you have any questions for TAB or would like to see more of his graphs etc. etc. etc., all you have to do is write to him here: tabbat841@hotmail.com. Looking at TAB’s graph, the Stage I limit is 1,000, where the blue line is. B2M means Beta-2 microglobulin; Alb = albumin. These are the two markers used in the ISS. I had to edit the graph a bit so that it would fit better on the screen, which means that it looks a bit more squished up compared to the original. But if you click on the graph, it should appear a bit LARGER in a separate window. Then just click on the “back” arrow to return to my blog. Don’t miss the fact that in 2002-3, TAB slipped into Stage II (highlighted in yellow). Then he went back to Stage I, where he has remained. 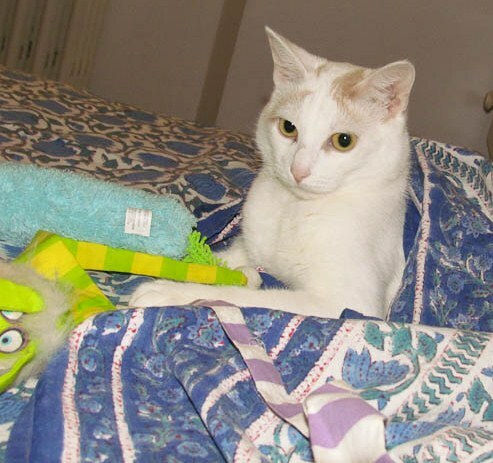 As promised, here is TAB’s summer 2012 update. Before reading it, though, please take note of a KEY sentence: These supplements may or may not work for others as they apparently do for me. That is soooo true. It’s the same with curcumin, which may not work for some folks yet works splendidly for others (like yours truly 🙂 ). I’d also like to thank all those who offered to help me with the technical issues. In particular, Rudi, who already had the TAB files in his possession and went ahead and converted all the graphs into an “uploadable” format. Grazie, Rudi! 🙂 And Richie, who offered to help, too, which was super kind of you, thanks!!! And Stefano, my hubby, who has been working so hard but finally had the time to show me how to convert the graphs etc. (so the Table at the bottom of this page is mine, all mine, yaaay!). I have been smoldering for 14 years. I remain asymptomatic with no C. R. A. B. symptoms. That is: No elevated Calcium, No Renal failure, No Anemia and No Bone Lesions. The latest IgA value of 3136 mg/dl is the lowest it has ever been since diagnosis! See IgA Graph. M Spike is 3060 mg/dl. I am pleased with the improvement in the Lambda light chain data and the Kappa/Lambda ratio since both are approaching their normal range. I remain on my daily supplements of Inositol, IP6, Selenium, Vitamin C and D, Trans Resveratrol, Curcumin plus a multivitamin. I take one half of the IP6 /Inositol first thing in the morning on an empty stomach and the remaining half before bed. I take the Curcumin all at once usually with a meal that contains some fat or oil. The other supplements I spread out over the day. Supplement cost is about $1.37 per day depending on current prices. 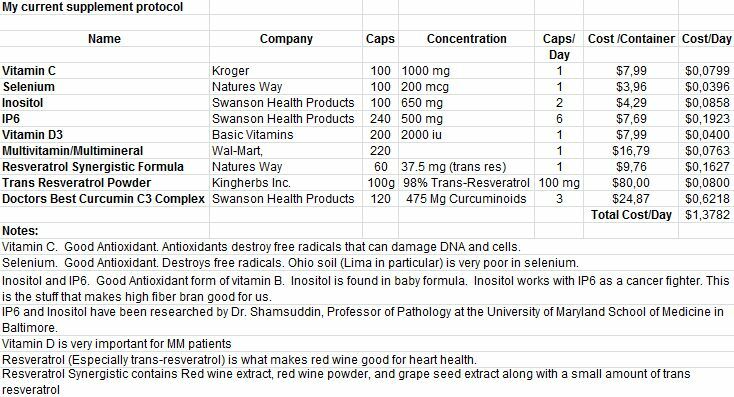 My current supplement protocol is shown on the Supplement worksheet (see below). See the notes on the IgA worksheet for the changes that I made over the years in an attempt to refine the supplement protocol. I feel that the trend lines in the attached graphs show a definite correlation of improved markers with the taking of supplements. The MM has by no means been eradicated, but I have enjoyed a very homeostatic control of the markers with no symptoms thus far. These supplements may or may not work for others as they apparently do for me. I have been lucky to have had the time to see results which in some cases took years to manifest. I firmly believe that the supplements are responsible for my stable condition. I eat a typical American, somewhat well balanced diet, but nothing special. I enjoy golfing (walking) in the summer and have a Body Mass Index at the upper end of normal. According to the NEJM paper by Kyle et al (Ref #6 in the Case study report), the probability of progression from MGUS to Myeloma is a constant 1% per year. For smoldering myeloma, the risk of progression is greater in the early years but decreases with time. Examination of the graph of Figure 2 shows that after 14 years the slope of the smoldering curve is identical to the slope of the MGUS curve. I interpret this to mean that my risk of progression is now 1 % per year, the same as for a MGUS patient! I am providing this information in two different formats. One is in pdf format for easy reading and printing. The other is in Microsoft Excel spreadsheet format. If you would like to use my Excel spreadsheets to help you plot your data (which I highly recommend plotting ones own data) you can just replace my dates and values with your dates and values and the graphs should (hopefully) automatically plot for you. When I visit my doctor I show him the graphs which helps him to visualize any progress or lack thereof rather than him scanning through several pages of numbers which makes looking for trends very difficult. Smoldering Myeloma – An 11 Year Case Study Using Supplements. Updated and revised August 6, 2009, by TAB. Are supplements an alternative to conventional treatment of smoldering myeloma? Standard recommendations for treatment for smoldering myeloma include observation for progression of disease. Some authorities have proposed supplements such as IP6 and Inositol, Inositol + Cal Mag IP6, selenium and antioxidants may prevent cancer or slow down cancer progression. I have collected data over the past 11 years and present myself as a case study to argue these supplements can slow down or reverse the progression of smoldering myeloma. I am a 67 year old white male diagnosed in 1998 with asymptomatic smoldering/indolent IgA lambda multiple myeloma. The diagnosis was triggered by a borderline total serum protein (8.7 g/dl (6 to 8.3 g/dl) on routine testing. Further testing revealed an IgA level of 3220 mg/dl (81 to 463 mg/dl). Serum protein electrophoresis revealed an M spike in the beta region of 2.5 g/dl. A bone marrow biopsy showed 40% plasma cell involvement. A bone marrow biopsy 3 years later showed 27% plasma cells. A full body bone survey was negative. Please see Figure 1 for changes that I made in the amounts of the supplements over the years. Please note that in a recent correspondence with Dr. S, he recommended a 1:1 Molar ratio of IP6 to Inositol and an amount that works out to be 4.8 grams of IP6 and 1.32 grams of Inositol per day. These supplements are very well tolerated with absolutely no observable side effects. Inositol is found in baby formula. Within one year of starting the supplements the trend lines started changing slope. In Figure 1, the IgA values that were increasing after diagnosis, leveled off after the first 5 years and have been decreasing during the latest 5 years. Figure 2 shows the 24 hour total urine protein increasing, leveling off and decreasing in a like manner. Figure 3 shows Beta 2 microglobulin increasing but leveling off after 10 years. Figure 4 shows hematocrit decreasing, leveling off and then increasing. Figure 5 is a plot of the ratio of Beta 2 microglobulin to albumin. 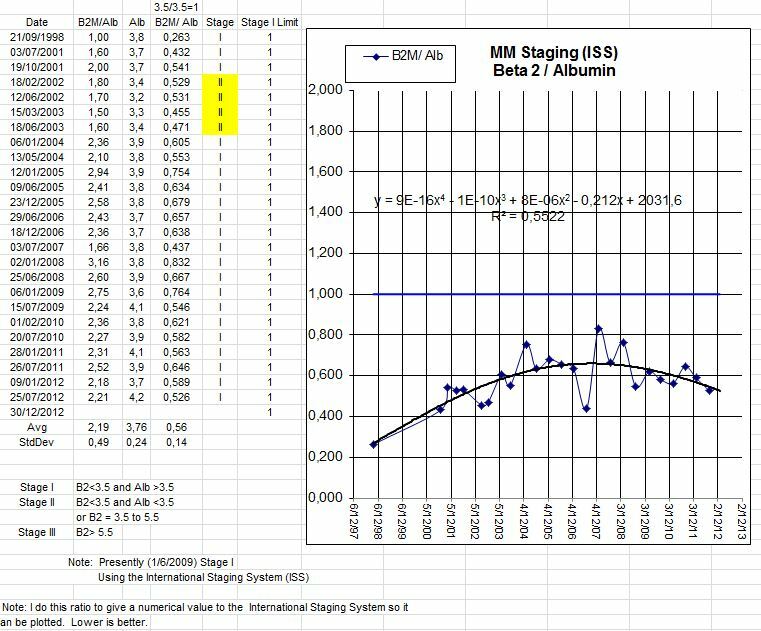 This is a way of plotting the two factors (beta 2 and albumin) that form the basis of the International Myeloma Foundation’s ISS (International Staging System). This data also shows a leveling off trend. In all of these graphs it is best to look at the solid trend line because it filters out the scatter in the data. Excel allows the user to pick the best trend line equation to best fit the data (you want the R squared value to be as close to 1.0 as possible.). Table 1 lists a record of several tests such as bone marrow biopsy, protein and urine electrophoresis and immunofixation, skeletal X-rays and others. These trends are encouraging in light of the statistics dealing with the probability of progression from smoldering myeloma to active myeloma as published in the New England Journal of Medicine June 21, 20076. This report states that the probability of progression is 10% per year for the first 5 years, 3% per year for the next 5 years and about 1% per year thereafter. Thus in my case after 11 years since my diagnosis of smoldering myeloma, the probability is 67% that progression to overt myeloma would have happened by now. I apparently am one of the 33% that have not progressed after 11 years. The data in Figures 1 – 5 seems to indicate that the disease is not progressing and it may actually be receding. Did the supplements cause a decrease in progression or would the results have been the same without the supplements? I would argue the statistical significance of trend reversals suggests the supplements were the cause of the reversal. At about $1 a day cost and no side effects, the benefit to cost ratio is quite high. In the Kyle study6, why do some patients not progress after 10, 15, 20 or 25 years? Were they taking supplements? Did they make life style changes? What other factors might contribute to their better outcome? Many myeloma patients that discuss their care on the International Myeloma Foundation’s MMA mailing list, have had various degrees of success experimenting with alternate supplementation plans while waiting for mainstream medicine to do their clinical trials. I think that it is safe to say that more people are taking self directed supplements than most doctors are aware. Some with more serious myeloma do it out of necessity because they don’t have time to wait. I would encourage patients to track their data using an analysis package that includes trend line analysis. The trend lines allow the patient and his/her doctor to make statistically significant decisions based on trends rather than on a few data points. The spreadsheet allows statistics like standard deviations to be easily calculated. I have read where many patients ask questions like “is this data point really a significant increase or is it just lab variation”? If the data point deviates from the trend line by one or two standard deviations, it is probably not statistically significant. If it changes by three or more standard deviations, then it is probably significant. Another area of discussion is the issue of myeloma stem cells. Should the smoldering myeloma patient consider adding a supplement to specifically target myeloma stem cells? Possibly so, as long as it is relatively safe. I am presently researching cyclopamine tartarate and zerumbone. I might consider taking such a supplement in very small quantities and track the results with the graphical trend line analysis. IP6 Inositol 1.5 g/day, Inositol 2 g/day, Selenium 200 mcg/day, Vitamin C 500 mg/day, Vitamin D 1000 iu/day and a multivitamin/multimineral per day may slow or reverse the progression of smoldering myeloma. For those patients whose trend lines are moving in the wrong direction, this or other supplementation plans may be an alternative to the watch and wait approach. Whether supplementing or not, plotting critical lab numbers and using trend lines to monitor your progress is highly recommended. 1. Kyle, Robert A. MD, et al. Criteria for the classification of monoclonal gammopathies, multiple myeloma and related disorders: a report of the International Myeloma Working Group. British Journal of Haematology, 2003, 121, 749-757. 2. Shamsuddin, AbulKalam M., MD, PhD. IP6 Nature’s Revolutionary Cancer-Fighter. Paperback edition. Kensington Books, 1998. 3. Vanderlinden, Kim, ND, DTCM, Vucenik, Ivana, PhD. Too Good to be True – Inositol + Cal Mag IP6. Bearing Marketing Communications Ltd., Sept. 2004. 4. Passwater, Richard A., PhD. Selenium Against Cancer and Aids. Keats Publishing Inc., 1996. 5. Durie, Brian G. M., MD. International Myeloma Foundation Patient Handbook, 2008/2009 edition. 6. Kyle et al. Clinical Course and Prognosis of Smoldering (Asymptomatic) Multiple Myeloma. The New England Journal of Medicine. June 21, 2007; 356(25): 2582-2590.